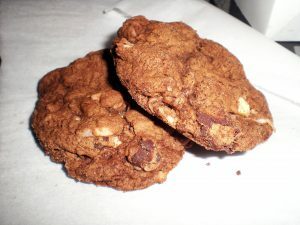 After I made the other chocolate coconut cookies (Bounty Cookies), I realised that they were kind of a pain to make, and they did not keep very well. So when it came time to actually make something to ship, I decided to retool. Out of laziness, since one person wanted chocolate, while the other wanted coconut, I came up with a Chocolate Coconut Cookie so that I only had to worry about making one thing. 2. Melt 2 cups morsels in small, heavy saucepan over lowest possible heat. When morsels begin to melt, remove from heat; stir. return to heat for a few seconds at a time, stirring until smooth. Combine flour, baking soda and salt in medium bowl. 3. Beat butter, brown sugar, granulated sugar and vanilla in a large mixer bowl. Add eggs one at a time, beating well after each addition. Beat in melted chocolated. Gradually beat in flour mixture. Stir in remaining chocolate chips and coconut. Drop by rounded tablespoon onto ungreased baking sheets. 4. Bake for 9 minutes or until cookies are puffed. Cool for 5 minutes on cookie sheet, then remove to a wire rack to cool completely.